The giant Panda has a distinctive white head with black eye patches, ears and shoulders. Unlike other bear species, giant pandas are herbivorous, spending up to 12 hours a day chewing bamboo shoots and roots. Because of poaching and habitat loss, they are extremely rare, occurring in small populations in the bamboo forest of China. Despite being the subject of major international conservation efforts, wild populations of giant pandas may not be enough to save this species. Giant pandas have lived in the bamboo forests of China for millions of years and have been honored by the Chinese for a very long time. 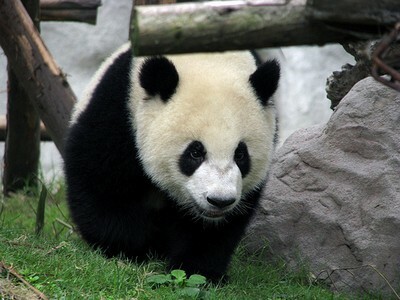 In fact, giant pandas have appeared in Chinese art for thousands of years. Because the giant panda is considered a national treasure in China, it is protected by law so that it does not become extinct. By what has the panda been protected so that it does not become extinct? How long have giant pandas lived in the bamboo forests? Where have pandas appeared for thousands of years? At the end of the day, how much time has a panda spent chewing bamboo? What have pandas been considered by the Chinese people? who has honored the pandas for a very long time?